When was the last time you used the Yellow Pages printed directly? I struggle to remember. Interestingly, today, San Francisco's board of supervisors voted 9-1 to ban the delivery of Yellow Pages printed directories, unless specifically requested for delivery. 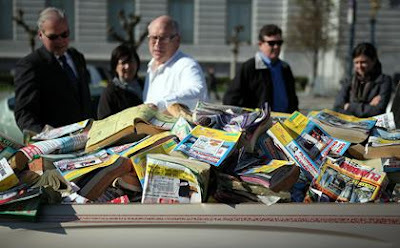 "The over-distribution of telephone directories results in an unconscionable waste of natural resources, and costs the city over one million dollars every year to process through our re-use system," Melanie Nutter, director of the San Francisco Department of the Environment, said in a statement. In today's world of super-fast broadband, a plethora of internet connected devices, and technology like Google Instant to make finding local businesses super quick, it is becoming increasingly difficult to comprehend why anyone would continue using printed directories. While a small portion of the population might still use printed directories, no doubt Australian cities will soon be following the lead of San Francisco and introduce an opt in system for printed directories. With well over 90% of Australian's using Google Search, and with less and less people using printed directories every year, it may just be a good time to consider your businesses ongoing investment in advertising and ensuring that this is reaching as many prospective customers as possible, and delivering highest ROI (return on investment). Google AdWords advertising allows businesses to directly reach prospective customers online, through high rankings within Google Search results, on all important product/service based keywords, while also offering increased flexibility allowing for daily AdWords budgets to be adjusted seasonally (e.g. when additional work is required). Professionally managed AdWords advertising campaigns also allow for a great deal of measurability, allowing focus to be directed onto keywords which are most effective at generating high quality traffic, which is most likely to generate enquiries and sales. At the end of the day, you have to go where the people are. If at the same time your advertising dollar can produce higher ROI and allow for increased measurability, and flexibility, then that's a bonus! Now is a good time to re-evaluate your businesses advertising mix. It's more important than ever to ensure prospective customers who are already searching for your products and services, find YOUR business. Like to chat about professionally managed Google AdWords advertising? Make contact today.